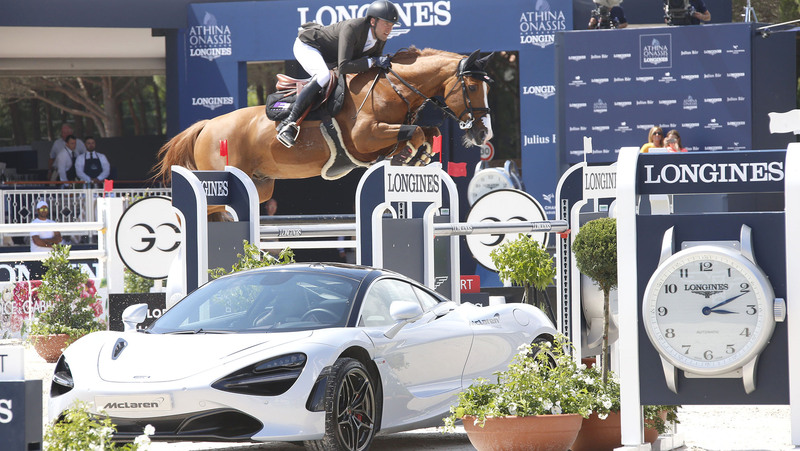 The first class of the Longines Global Champions Tour of Saint Tropez, Ramatuelle, kicked off in true red-carpet style with Simon Delestre (FRA) and Chesall Zimequest taking a high-octane win in the CSI5* McLaren Prix. With guests and VIPs settled into the luxurious surroundings, there was an air of anticipation and excitement as the first CSI5* class of the weekend kicked off. 67 of the world’s best international combinations took to the arena, but it was the flying Frenchman who took a win on home soil, much to the delight of the local spectators. Second went to Sameh El Dahan (EGY) with Championes and third place to Jérôme Guery (BEL) with Celvin with less than 1 second separating the top five. Uliano Vezzani’s first course of the weekend threw up a few challenges for the top athletes in show jumping, including a tricky double angled at a dog leg across the arena. A beautiful McLaren P1 was parked in the centre of the arena, eye-catching for most but no distraction for the horses and riders. Daniel Deusser (GER) took an early lead with the head-turning grey Cornet, the light and agile grey and white speckled horse perfectly suited to the long sand arena. 29.78s was the new time to beat, with the fast time forcing others into errors. Cameron Hanley (IRL) and Aiyetoro picked up a costly eight faults in the second phase, and others including Alberto Zorzi (ITA) and Nayel Nassar (EGY) rolled a pole trying to make up the time. Hot on the German’s heels was American rider Laura Kraut (USA), with her fiery chestnut Whitney putting in a speedy round to slot just behind Deusser in 29.80s. Peder Fredricson (SWE) with H&M Christian K also gave it a valiant try, but couldn’t match their time to stop the clock over a second slower in 30.89s. The French speed merchant Simon Delestre (FRA) looked determined to better Deusser’s time, setting off at a blistering pace with Chesall Zimequest at their home event. The pair shaved fractions of a second off the original time to beat, taking the win in 29.12s. The next class kicks off at 17:10 local time, the GCL of Saint Tropez first round which will see the teams battle for pole position ahead of Saturday’s showdown.